The cowboy tradition of the Old West as we know it originated in Spain, where arid climate and sparse forage meant that herds of cattle needed to cover large distances in order to obtain enough food. This required cattle herders on horseback rather than on foot. During the 16th century, Spanish settlers brought their cattle-raising traditions, as well as horses and domestic cattle, with them to the Americas. In one fell swoop, cattle ranching and cowboys were born in the Old West. 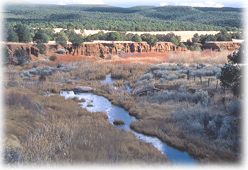 The vast open land of New Mexico and the Southwest brought about open range ranching, in which cattle and other livestock were turned loose in spring to forage. In the fall, the mature animals were rounded up and driven to market. The breeding stock was then kept close through the winter for safety. The state bird of New Mexico, the roadrunner, is a terrestrial cuckoo. It is famous for its unusual appearance, its ability to catch and eat rattlesnakes, and its habit of scooting across the desert, as popularized by Warner Brothers cartoons. The roadrunner is a large, mottled bird with a distinctive head crest. It has strong feet, a long, white-tipped tail, and an oversized bill. When it senses danger, the roadrunner flies, but is too heavy to stay airborne for more than a few seconds. It is capable of running up to 17 miles per hour.